I love my new Nestibilities!! And I love this turtle from the hostess set Older and Wiser. The card base is Wild Wasabi, and I used some DSP from last catalogs hostess scrap kit cut to 3 x 3 1/4 and layered it on Pumpkin Pie. The strip is Blue Bayou with Pumpkin Pie eyelets. Mr. 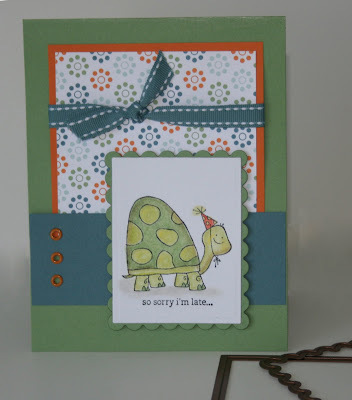 Turtle was stamped with Black Stazon and colored with Prisma color pencils and blended with gamsol, he is layered on the scalloped Wild Wasabi. The ribbon is from SU and is the Blue Bayou Double Stitched Ribbon. Well, I'm off to St Pete to look at another studio with my daughter. She is set on moving up there by herself! She's alot braver than I was at 18.